Belcarra’s USBLAN (http://usblan.belcarra.com/) solution, a USB Class driver, enables peer-to-peer Internet networking among handheld devices and to the Windows and Mac desktop. With the addition of the Data ReDirection Service it now also provides an inexpensive method for mobile devices to interconnect with Cloud servers. Belcarra Technologies, a leading developer of USB software and device drivers, announced today the addition of a network service solution to their USBLAN product line that allows small mobile devices to have inexpensive connectivity to Cloud based servers. 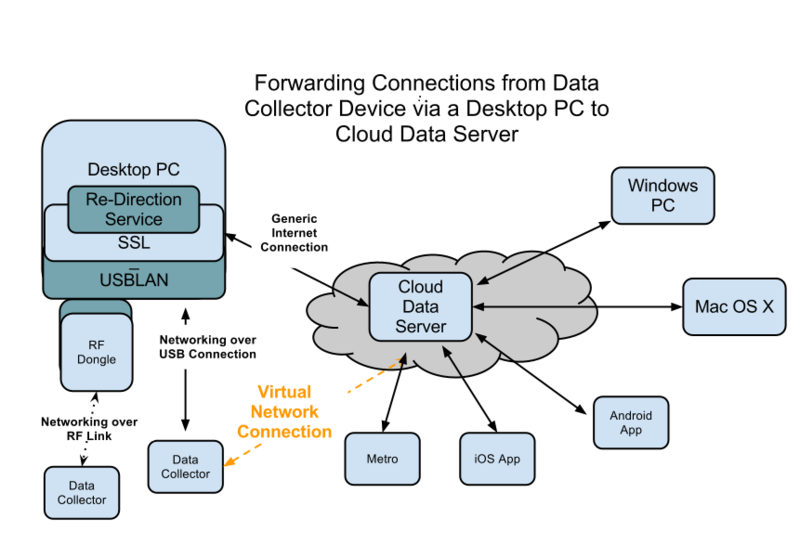 It is not uncommon for today’s small mobile Data Collection devices to have a basic requirement of being able to connect to Cloud based servers for the delivery of data for processing, either offline (from the device’s perspective), or to access Web Based applications. While more expensive devices may use WiFi (or Ethernet), low end devices can simply use Belcarra's USBLAN Networking over USB solutions and accomplish the same results at a significantly lower cost. Belcarra’s USBLAN enables peer-to-peer Internet networking among handheld devices and to the Windows and Mac desktop. With the addition of the Re-Direction Service it also enables the USB host to listen for inbound TCP connections on specified ports. For any inbound connection a new connection is made to another Data Server for either the same or a different specified port. Data is then copied in both directions. Effectively the Data Collector device and Data Server are not aware of the third party acting as a proxy (transparent relay). The relay can be intelligent, for example as a security measure relaying port 80 from the device to port 8888 in the cloud, with the device not aware of which port is being used. The Redirection Service works independently of the USB Networking protocol, so CDC (ECM, EEM, NCM) and RNDIS protocol based devices are all supported. Web Based applications are usable across a wide range of platforms, including desktop and mobile devices. Belcarra Technologies (2005) Corp. provides comprehensive USB support for smart embedded devices and network driver support for a wide variety of systems, especially MS Windows, Mac OS/X and Linux. Belcarra's USB solutions are developed with close attention to USB-IF and other industry standards. For more information, please visit the Belcarra website http://www.belcarra.com or contact a representative at +1.604.617.3649.